Brought this for my twin grandsons for Christmas I know they are going to look absolutely adorable when they wear it. This jacket is definitely an eye catcher the leather is soft as well as the fur. It’s exactly what I thought it would be. 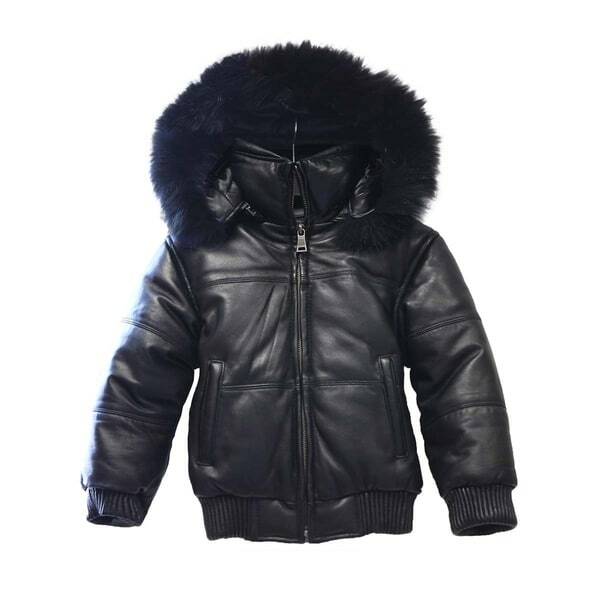 Keep your child warm with style in this fully lined genuine lambskin leather bubble bomber jacket. Soft and durable, this jacket stands up to the daily wear and tear of a child's life, while the detachable hood provides versatility. This jacket is soft and provides comfort and warmth in transitional weather. Dimensions 20.0 In. X 15.0 In. X 1.0 In. The Kid’s Black Genuine Leather Bubble Bomber Jacket with Hood is a very high quality coat. I purchased this as a gift and I absolutely loved it. Awaiting Christmas so I can see if he loves it, as well.